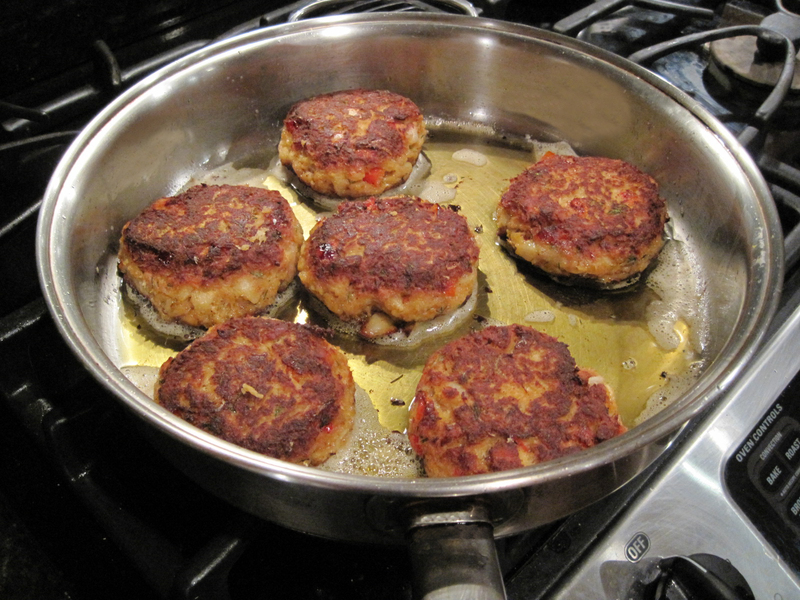 Fish patties can be made with any flaky white fish. I like tilapia because you can buy it in fillets with no skin or bones to remove and it is not very expensive. This recipe is very good served with the Roasted Corn Salad. There are various ways to start a fish poaching liquid. I save shrimp shells from other projects and freeze them. Then bring the shrimp shells, lemon rind and 3 cups water to a boil. Simmer for 10 minutes and strain out the solids. Bring the liquid back up to a simmer. If you have fish stock, vegetable stock or clam juice on hand, they will enhance the flavor. After poaching the fish, strain out any remaining solids, cool the liquid and freeze in a container for future recipes. The liquid will get more intense in flavor with each use. Be sure to freeze the liquid between uses and bring to a full boil before reducing to a simmer to eliminate the possibility of bacteria. Bring the prepared poaching liquid to a simmer. Poach the fish until cooked through. Remove the fish from the liquid and squeeze out excess liquid. Break apart the fish with your fingers until it is in flakes. Dice the red bell pepper and put it in a large, microwaveable mixing bowl. Microwave for 2 minutes or until softened. Add the flaked fish, scallions, capers, eggs, and parsley to the bowl. Mix together and add just enough bread crumbs to hold the mixture together, so you can form a patty. Season with lemon juice, paprika, salt and pepper. Pour enough vegetable oil into a large frying pan for a quarter inch of depth. Heat the vegetable oil until it shimmers. 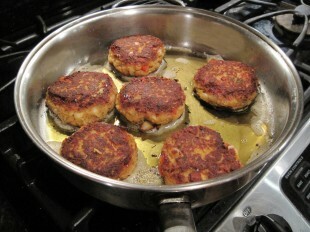 Form the fish mixture into patties that are about 3 inches in diameter. Fry in the hot oil until the bottom side is golden brown. Carefully flip each patty over and fry until the other side is also golden. To make the tartar sauce, mix all the ingredients together in a small bowl. Season with lemon juice, paprika, salt and pepper.